Among the best stories in “Get In Trouble” the new collection from the inimitable Kelly Link, is “Two Houses.” In it, a group of multinational astronauts from the future hurtles toward Proxima Centauri, a journey that will take them hundreds of years, during which the voyagers go to sleep for long lengths of time. Their vessel, a ship called House of Secrets, runs on a vaguely sinister operating system named Maureen. 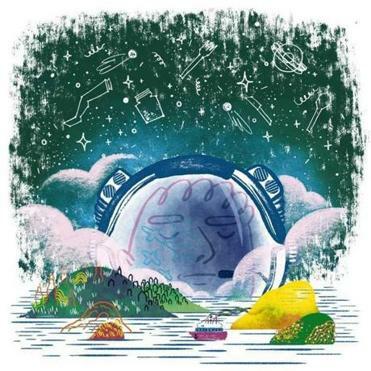 It puts the astronauts to sleep, wakes them up, conjures synthetic food for their meals, and fills their heads with fanciful hallucinations almost indistinguishable from real life. The above is all the explanation Link provides for Maureen’s magical abilities, and all the reader needs in order to accept that they exist. Within this realm — one somewhere between full consciousness and dreaming — she conjures a ridiculously brilliant tale utterly devoid of technical details or anything else that might free the reader from Link’s thrall. The astronauts decide to celebrate their wakefulness by telling ghost stories, one of which involves a terrifying conceptual art installation far creepier than any work as yet to be made in the real world. Through the astronauts’ vivid fantasies and the tales they tell, Link is able to interrogate the uses of narrative and the truths of perception without a whiff of pedantry. Commerce, empire, legacy, ghosts; all make their way into a showstopper that comes in at just 25 pages. That’s Kelly Link in a nutshell: inordinately brainy, always concise, darkly whimsical, and entertaining as heck. Her first collection, “Stranger Things Happen,” thrilled readers with an utterly original voice that defied the confines of genre and got at the heart of human experience in a mysterious, funny, and often totally bonkers way. The intervening decade and the storybooks she published therein — “Magic for Beginners,” “Pretty Monsters” — established her as one of America’s finest writers in the short form, and perhaps its very best at conjuring mood. “Get In Trouble” shares many elements with its predecessors, like magic, splendid sentences, and stories that are actually perfect, tiny, self-contained universes. But in her current collection, ever-present, pitch-dark undercurrents swirl yet closer to the surface. The darkness imbues the stories with a sense of urgency and importance, helping them to transcend those that came before. Like most of us, the protagonists that populate “Get In Trouble” face decisions with questionable moral judgment. Unlike the rest of us, however, theirs have potentially devastating supernatural results. The hardened teenage girl in the O. Henry Prize-winning “The Summer People” is destined to take care of an eerie vacation home filled with “[d]olls’ legs and silverware sets and tennis trophies and mason jars and empty matchboxes and false teeth and still chancier things.” Though readers never learn the owners’ identity, we do become aware of the uncanny power of their house and the terrible hold it has on the protagonist’s family. What will she do to escape? “I Can See Right Through You” tells the story of a fiendishly handsome, immortal demon lover with commitment issues and a case of arrested development. After starring in a romance film and falling in love with a mortal woman, he launches into a series of one-sided relationships and pines away for his first love, whom he eventually visits on the set of her new reality show. What sort of terrible thing could have driven them apart? Two stories in particular showcase the awesome breadth of Link’s range. The first, “The New Boyfriend,” chronicles petty infighting among a group of spoiled, pubescent girls. Through protagonist Immy, Link captures perfectly the nebulous, overwhelming envy, painful self-recrimination, and dawning self-awareness that plagues early adolescents. “It’s normal to want to give your best friend something because you love her. Because you want her to know that you love her. It isn’t a competition. Ainslie loves Elin and Immy and Sky equally, even if Immy and Ainslie have been friends longest.” What catapults the story to greatness is the introduction of the Boyfriends, life-sized, eerily realistic animatronic dolls programmed to pepper their teenaged owner with the kinds of platitudes made famous by Twilight’s Edward the Vampire. After Ainslie’s mother buys her a Ghost Boyfriend, solipsistic teen jealousy inflicts eternal suffering. The second, “The Lesson,” couldn’t be more adult. A gay Boston couple hires a surrogate, stresses terribly about their impending baby, then travels to a remote island to attend the wedding of their friend Fleur, a notorious party girl who now “has not only filthy improvisatory cunning, but money. Who is paying for all of this?” Strange and frightening things start to happen on the island, soon dwarfed by the terror of their surrogate going into labor at 24 weeks. Like everything included in “Get in Trouble,” these stories make you laugh while staring into the void. By the end, they’ll be with you sleeping and waking. They’ll be inside you, too.